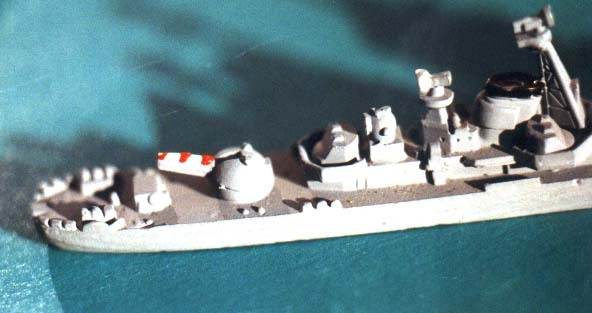 This article is about the few 1/1250 models of the first soviet guided misile destroyers, including one of those Hansa models that were completely wrong. 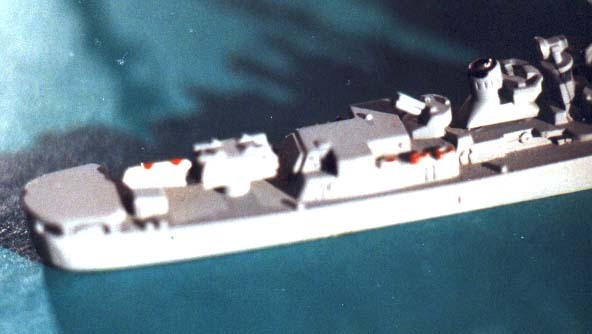 During the hot phase of the cold war the soviet navy developed its first ship-based missile. A special construction office (OKB=Opytno Konstruktorkoye Byuro) had been founded to develop a missile that was small and reliable enough to be used on ships. Of course this development was based on early post-war designs like the J-series, that was itself based on the german V-1 winged missile. In the mid 50s the first one was ready - the KSShch(= Karabel'nyy Snaryad Shchuka). Because it was the first naval surface-to-surface missile it got the Nato designation SS-N-1 and because it "scrubbed" over its starting device it received the Code-Name "Scrubber". Parallel to its development a testbed was build: the Bedovyy was begun as conventional destroyer of the projekt 59-type (nato-Codename: Kotlin), but finished the the altered desing projekt 59-EM (Experimental'nyy Modifitsovanyye). This type received the Nato_Codename "Kildin". Its main difference to the Kotlin was the large hangar in which 6 Scrubber were to be stowed. This hangar was about 11m long, 6m broad and 8m high, of shich 5m were visible above the main deck. The Bedovyy commissioned 25th march 1956 with the hangar in place, but the starting device (SM-59) still misssing. It was added later during 1956 and the first testshot took place on 2nd jan 1957. The first test was a failure, but later tests were successful - even on fast moving targets. Three more Kotlin under construction were finished to a similar design (projekt 56-M). These four Kildin-class ships were a testbed and stop-gap construction. Parallel a new ship was especially designed to carry two KSShch-systems. This type (projekt 57bis) had to be larger than a Kotlin/Kildin to accomodate two of these bulky weapons. They were 12.8 m longer and 2m broader than their predecessors. The first was laid down in November 1957, the last entered service in Sep 1961. NATO designed this type as Krupny. They had an helicopter-pad at the aft to carry a Kamov-15 ("Hen") intended as extended lookout. It proved to be unsuccessful and was later omitted. 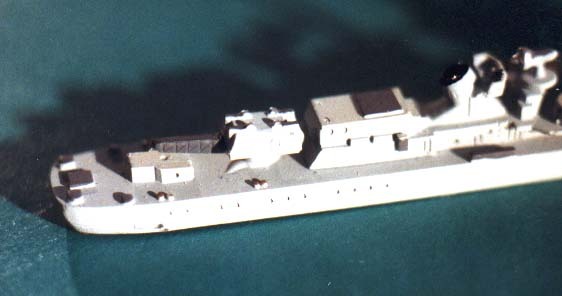 It was planed to build 12 of these ships, but in 1960 the cheaper and more capable SS-N-2 ("Styx") as used on the fast missile craft of the famous "Komar" and "Osa" classes became available. So the program was cut back and only 8 ships (of 9 already laid down) were finished. 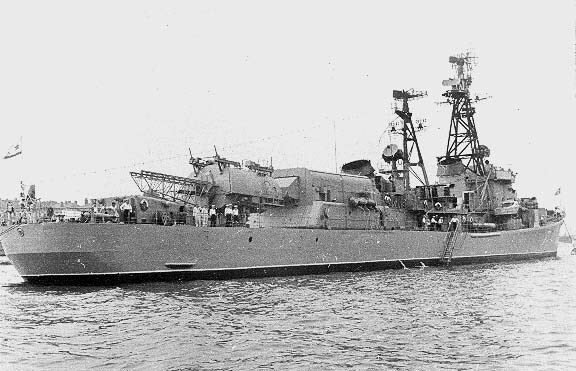 Further new missiles became availabe in 1962 with the ships of the Kynda-class (projekt 58) and on 23th jun 1965 the order was given to convert the large rocket ships (Bolshoyy Raketnyy Korabli=BRK) of the Krupny-class to large anti-submarine ships (Bolshoy Protovolodochnyy Korabli BPK). of the Kanin-class (projekt 57A). During this conversion the SS-N-1 were completely removed and replaced by other weapons. I know of only three models of these Kildin and Krupny classes. The first was issued by Hansa and - as with other wrong Hansa models of tthat time - it was made prematurely without sufficient information. This Hansa-model ist not a "Kildin", but a "Kotlin" with the aft gun replaced by some purely fictional rocket-launcher. The Trident Alpha model of a "Kildin" was obviously made later with better information. It is an interesting comparision of the wrong Hansa-model with the correct Trident one. When Hansa issued their Krupny they had fixed their errors about how an SS-N-1 looked and made a decent model. Of course all these models can not compare with the detail one is used to today from companies like Neptun, Rhenania, Argos, Albatross, Optatus and others. But within the limits of the spin-casting method the Hansa-Krupny and the Trident Kildin are decent models. The Hansa "Kildin" (it is still called "Kotlin" on its bottom) is an odd mistake. Hansa made several such mistakes. They made a submarine designated as Whiskey-class which is completely wrong. It does not even have some similarity to a real Whiskey-class submarine, but looks like an odd combination of a Gato-hull with a Type XXI-sail. Probably that was how a Whiskey was described to Hansa's modelmaker before any pictures or reliable drawings were available. 1: Three ships with SS-N-1. Guess which one is wrong. 3: The Kildin from Trident Alphay shows how these shps really looked. 5: This is how the original really looked. I found this picture on Victor Kopylev's fine site with pictures of the russian navy. Sadly this site seems to be unreachable now - or has moved.